Sit back let the counters accumulate on Skullbriar until your ready to strike. 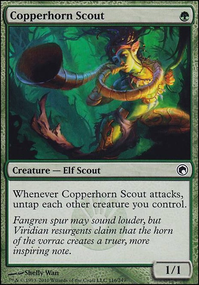 I say midrange because there's some setup here that needs to happen before you can seriously start attacking and doing Commander damage with Skullbriar. The setup is not aggressive cards they're midrange cards. Never cut one drop mana dorks. In fact consider adding more: Llanowar Elves , Elvish Mystic , Fyndhorn Elves , Arbor Elf ? 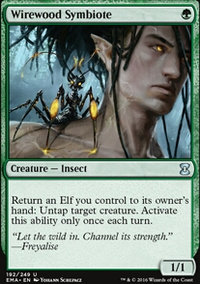 They're a huge reason to want to play green in Commander. Maybe they don't interact the best with Skullbriar since he's only two mana to start, but they create ramp for other cards that you want to play which are just as important than Skullbriar. Greater Good is too good of repeatable draw with Skullbrair's ability to keep his counters and it's a sac outlet. Sac outlets help to get value, able to sac Skullbrair in response so he isn't constantly going back to the Command Zone just choose to instead put him into your graveyard. Carrion Feeder , Yahenni, Undying Partisan , Ashnod's Altar and Evolutionary Leap are other sac outlets to consider. Skullbriar doesn't loose counters when he's put into your graveyard this makes him a good target for sac outlets and reanimation to bypass Commander tax. Just don't recur him, have to reanimate him, skipping your hand and putting him right onto the battlefield. Journey to Eternity Flip has been suggested and it's good with sac outlets to sac the creature enchanted to flip it to then have a repeatable way for five mana to reanimate Skullbriar. Animate Dead , Unearth and Vigor Mortis are more ways to reanimate Skullbriar. Don't be afraid to put Skullbrair in your graveyard; if your graveyard gets exiled when he's in it, he doesn't get exiled, you can choose to put him back into the Command Zone. Ring of Kalonia , Evolutionary Escalation , Kalonian Hydra and Reyhan, Last of the Abzan ($5) are no mana cost repeatable counter engines with Skullbriar. Increasing Savagery and Solidarity of Heroes can put a lot of counters on Skullbriar for the mana costs. Deathrite Shaman and Scavenging Ooze are Golgari staples, especially good in multiplayer Commander where there's four graveyards to choose from. Swiftfoot Boots and Canopy Cover can help to protect Skullbrair. Boots also has haste good with reanimated Skullbrair and Cover gives evasion. Regrowth , Treasured Find and Eternal Witness can recur any one card from your graveyard good to get back reanimation spells or anything else. zapyourtumor on Planeswalking with Dinosaurs. 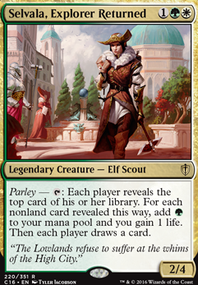 If going with Utopia Sprawl , it's usually better to use that with the Arbor Elf ramp package. Replace Lightning Strike with Lightning Bolt . 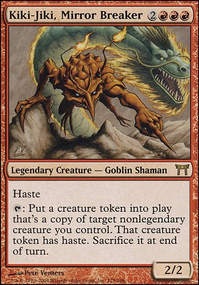 I would go up to a full four of bolts, its one of the most iconic magic cards ever printed. 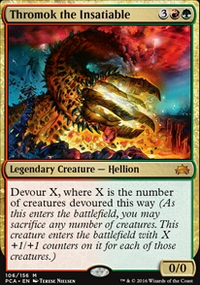 Perhaps extra removal in Path to Exile . If there are budget constraints, then maybe Condemn . Fetch and Shock lands to replace some basics and check lands if you can afford them. Cavern of Souls to add to Unclaimed Territory if you have way too much money to burn. 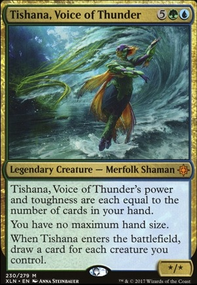 There are a lot of other very good tribal-oriented modern cards. e.g. Coat of Arms , Door of Destinies , Shared Animosity , etc. 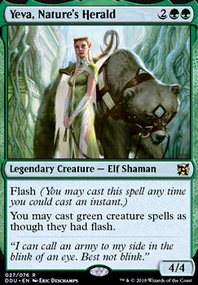 I would agree to using Arbor Elf since the deck involves stacking enchantments on lands on the battlefield. So I'll definitely swap those out. As for the Metallic Mimic and Adaptive Automaton I am conflicted as to whether or not I want to sacrifice flavor and style for cards that are undoubtedly good cards to add. If I had to go with one or the other which one would work best? Arbor Elf combos with Utopia Sprawl. 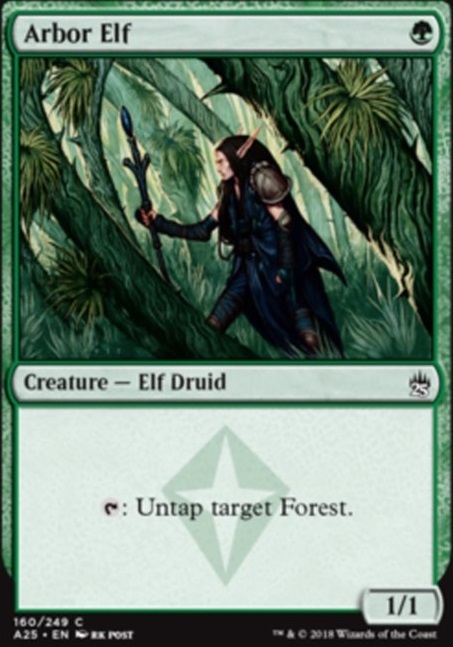 Also, Arbor Elf is way better than Llanowar Elves , especially since you're using Utopia Sprawl .